May 31st, 2016 is set aside to stomp out tobacco use around the world. The World Health Organization (WHO) is leading the effort with support from various groups and organizations around the world. “Get Ready for Plain Packaging” is the theme of this year’s campaign. The colorful and exciting packaging of tobacco products is a large part of their appeal. By limiting the type of packaging that can be used the appeal of the product is limited, as is advertising abilities, and the tendency to mislead consumers. Creating standardized packaging for all tobacco products will also increase the effectiveness of warning labels and other health information related to the products. An example of the standardized packing that WHO, and others helping with the cause, would like to implement can be seen below. Plain packing for tobacco products is part of a larger picture of tobacco product control. This packaging builds on already existing regulations of the market. Everyone can take action to stop tobacco use in their world. Individuals, policy makers, and civil society can step up and encourage government officials to adopt plain packing for all tobacco products! 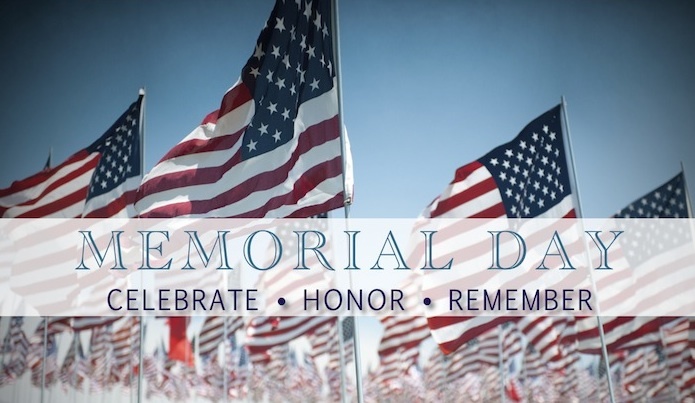 Monday, May 30th 2016 is Memorial Day, when Americans stop to remember those who have given their lives in the service of our nation’s armed forces. There will be no classes meeting on this day. “When you nestle into your mother’s arms, there is never a thought of tomorrow. Matter of fact, the journey has not even begun. You look up to your older brothers and sister who are well balanced and are either tending the house or doing chores that a farm brings. I am the fourth child of eight. For the journey I will have many mountains to climb and torrents of rivers to cross that will almost sweep me off my feet. I suppose one advantage I have over many is that I have never given up. At times I have been exhausted and precariously hanging on for grim death on sheer rock faces, miles in the air with little help. Who needs help? There is nothing wrong with me. I am a male, six feet tall and full of muscle. But now, married and two small children in tow, I sat on a rock near a stream and said I am tired, my brain is bruised, it feels I cannot go on anymore. Just leave me by this stream and you go on. My wife refused and she sat by my side as if we were just married this morning. Come on Phil, you have got to get up – you need some help. There I sat at the Doctor’s surgery, now on a long journey of highs and lows. We had acquired a small ranch from my work as a lumberjack in the mountains, felling pines that shone so bright when the sun appeared. But I cannot wave that chainsaw anymore. It sits in the shed collecting dust. I am not sure it even starts. As the doctor asked so many questions, he looked me up and down, then in a seemingly grumpy voice said “You have a mental condition”. No one ever told me I was depressed as well. I always asked questions, always got answers and felt I shaped myself. I have had to opt out of society a little. “I was first made aware that I had depression in 2001. I was 29 years of age and had recently completed a PhD in Australian cultural history. I had won a post-doctoral fellowship to research Australian literature at the University of Sydney and from most points of view appeared to be leading the picture of a successful life. I was in a long-term relationship and had loving parents, sisters and a brother. They all thought I was a swell guy. Yet in the mornings I would stare at the kitchen window of my third-floor apartment on Glebe Point Road and think that it would be a nice thing to open it and fall quietly to my death. Or, to calmly slice the arteries in my wrists and lie under the shower until I disappeared. “I noticed each time I left the house I would sweat all over and start to panic. As these attacks increased I shut myself in the house (my fortress). When they became worse I shut myself in my bedroom (my cocoon) with the curtains drawn and the door shut, completely isolating myself. The symptoms of these attacks included shortness of breath, feeling pressure to go to the toilet, shutting my eyes, coughing and hyperventilating, sweating, inability to talk, shaking legs, scratching or rubbing my arms, pulling my hair, banging the bed with the pillow or hands, pacing the room and sheer exhaustion. I thought I would collapse, faint, suffocate, lose control of my bowels, choke, lose control of myself, embarrass myself in front of others, harm myself or smash something. I would try to escape from the situation, avoid going out, seek the comfort of my bedroom, turn off the lights, shut the curtains or shout. The type of attack varied from spontaneous, anticipated to situational. They went on for a long time. I felt alone, because I was trying to hide what was happening to me from my family and friends. I was depressed, angry, embarrassed and ashamed because I couldn’t cope. I was exhausted from all my self-punishment and the frequency and severity of the anxiety attacks. I had no quality of life – enough was enough. My final punishment was going to be an overdose, but I couldn’t go through with it. I phoned the duty nurse at Osborne Park Clinic and she sent out the community nurse who came straight over to calm me down. She was unsuccessful and took me to the emergency department at Sir Charles Gairdner Hospital. From there I was admitted to the psychiatric ward with a severe anxiety disorder. I shut myself in my cocoon with the blinds down and door shut. It took weeks for staff to get me out of my room. The attacks were very frequent, severe and exhausting. After about a month, my psychiatrist suggested I apply to go to Hawthorn House, a mental rehabilitation center. Hawthorn House works on integrating its residents back into the community. You are supported to work on your individual issues, thoughts, feelings and concerns. Medication requirements are assessed and changed if necessary. This is all done in a caring environment. Once accepted, I had to make the decision whether to take the easy path and go home and continue to isolate myself, or to go to Hawthorn House and face my issues. This was a huge step and I accepted the challenge! My first two weeks were very tough and exhausting as my anxiety attacks increased. I felt insecure, unsafe and very alone. As the weeks progressed my attacks decreased, I began to feel more comfortable with the staff and my surroundings. I was coming out of my cocoon more and participating in groups. My medications were changed which seemed to help for a while. I felt small improvements were being made. After some weeks I started to feel like I was treading water and getting nowhere fast. I again retreated into my cocoon. My attacks increased and were more severe. I oozed frustration and anger and felt depressed. Outwardly I tried to present as if everything was okay. My situation was acknowledged and taken in hand by Carey and Steve, my key workers. A few days later I had a severe battle with my voices and thoughts in my head. I felt I was losing control over myself; so I stopped eating. It felt so good to have control again. After a few days I admitted to Carey and Steve that I was not eating, as per my care plan commitment. Steve gave me the ultimatum – eat or you have to leave Hawthorn House, due to the “duty of care” to residents. I took this very badly, was angry and felt very insecure. Rationally I knew the ultimatum needed to be given, but in my head I needed that control. After much walking, thinking, and, talking, I met with Carey and Steve. I agreed to eat my meals. The decision made me feel nauseous. I am battling at the moment with eating and wanting to vomit up my food. When I have settled down, feel more secure and safe at Hawthorn House, I will be ready to tackle what lies ahead with my recovery. I look forward to finding the person I used to be, or the new updated version. The last five years in the hospital mental health system were very difficult. I feel the system is under funded. The nurses, doctors, psychiatrists, and psychologists are overworked and underpaid. Hospitals have their place, but more rehabilitation centers like Hawthorn House are definitely needed. Go Far with the Fargo Marathon! May 19th-21st expect the city to be full of runners. It’s the time of year for the Fargo Marathon. Join us at MSUM on the 21st to cheer on our runners. We have convenient parking and lots of room to set up chairs or watch from the sidelines. As a bonus, you’ll get to listen to live music from local bands and see the runners pass by, not once, but twice! The marathon is in its 12th year and has grown immensely in popularity. Runners will start from inside the Fargodome, travel through the city, and end in the Fargodome surrounded by thousands of fans and spectators! After leaving the Fargodome runners will travel along the quiet streets or residential North Fargo before following the path along the Red River, into Moorhead, through downtown Fargo, and back to the starting point. The route will be lined with over 40 local bands and DJ’s to provide some entertainment and keep up the energy as the race continues. The Fargo Marathon is a USATF certified course and a true Boston Marathon Qualifier. It is also home to one of the largest youth races around! Participants in the youth race can choose from the 1/2 mile or 1 mile run that will kick-off with a warmup led by TNT Fitness! Whether or not you or someone you know is participating in the marathon come out for a weekend of excitement, fun, and to support the runners in their 26.2 mile journey! Write everything in a planner. Summer classes are usually not the only thing going on in a college student’s life. Students usually have jobs, want to hang out with friends, and see their families before fall semester. Laying everything out in a planner will help keep stress levels down and will allow students to have a little of everything this summer. A way to do this is to buy a planner at a local convenience store or download a free calendar app on your phone. Do not just stay in doors learning this summer. It is not healthy to always be studying and doing homework, while that is still extremely important, do not forget to spend time with friends, family, and yourself. Relaxing is just as important as studying because it will keep you sane and more energized to do school work. Go to class. Going to summer classes is very hard for students and professors do acknowledge this. Classes tend to be more fun in the summer because professors understand that distractions are at an all time high, but coursework still needs to be done. So to balance this out, professors try and make class more lighthearted to encourage the summer learning process. Taking classes in the summer can give second chances as well as speed up the time until graduation. If students have failed a course or two in the fall and spring semesters, summer is the time to get back on track. Summer classes allow students to retake courses that were previously failed because some colleges let classes that have been repeated replace the previously failed grade.This allows students’ GPA’s to increase and stay more consistent with their overall grades. While catching up is valued in summer classes, it is also important to take advantage of this time to get ahead. By taking many courses in the summer, this allows students to jump ahead of up to a full semester of college, thus making the time until graduation closer. Summer classes tend to have a smaller class size. Taking advantage of smallar class sizes in the summer is important because it could make a difference between an A in a class and a C in a class. By having fewer students in a class this allows professors to answer more questions and be there more often for students. So be sure to take advantage of class and ask as many questions as possible because there will be time for it! Overall, stay focused and active during summer and good luck with classes! The School of Nursing and Healthcare Leadership would like to take this time to congratulate MSUM student’s who are graduating today. A special congratulations goes out to all students graduating from an SNHL program! Today is the day of commencement. The ceremony is split into two parts based on the college the student is graduating from. Below you will find a Commencement schedule for the day! SNHL students will lineup at 1:00pm to walk with the College of Science, Health & the Environment. Below you will find the day’s schedule and a bit of information about location. If you are unable to attend the ceremony in person the link below will allow you to attend virtually!